Anyone tired of watching Yadier Molina do his thing? Yadi had two hits, two RBI and a very interesting run scored to help the St. Louis Cardinals win 5-2 over the Chicago Cubs. Oh, those hits also raised his National League-leading batting average to .355. And he is (thankfully) gaining ground on Buster Posey in the NL All-Star voting. It was another good night for Yadi — actually, a good night for all of the Cardinals once the rain ended and the game actually began. Shelby Miller was terrific yet again, although his start was cut short by cramping in his right leg. He left after 5 scoreless innings in which he gave up 2 hits, struck out 5 and walked 2. He also lowered his ERA to 2.08, which is third-best in the NL. And Shelby joins Adam Wainwright with 10 wins and Lance Lynn with 9 to make this the first time since 2005 the Cards have had three pitchers with 8 or more wins in their first 70 games, according to Tom Orf. Kevin Siegrist took over in the 6th inning and continued what he’s done since his debut: held the opponent scoreless. He retired four Cubs, including Anthony Rizzo on a great called third strike, and walked one. Siegrist has pitched 6 2/3 big league innings now and allowed just 1 hit while walking 2 and striking out 10. Seth Maness surprisingly did not get a double play — but runners have to be on base for him to do so. He relieved Siegrist with one out in the 7th and not surprisingly got two ground-outs. Neither Trevor Rosenthal nor Edward Mujica were their usual selves, each allowing a run, but everything was fine in the end. Trevor pitched 2/3 of an inning and gave up 2 hits and walked 1, while the Chief gave up a homer to Darwin Barney with 2 outs in the top of the 9th. He earned a 4-out save, which was no. 20 for the year — second in the NL. Back to the offense: after Travis Wood held the Cards to just a Pete Kozma double through three innings, the fun started in the fourth. Carlos Beltran and Matt Holliday each singled, allowing Yadi to drive them both in with his double. The 3rd run came on a play in the bottom of the 7th that was — well, interesting. And kind of confusing. Yadi started the inning with a single, which was followed by a David Freese single. A sacrifice by Jon Jay moved the runners up a base. That brought Kozma to the plate. He grounded to Luis Valbuena at third and was safe at first, and things kind of took off from there. 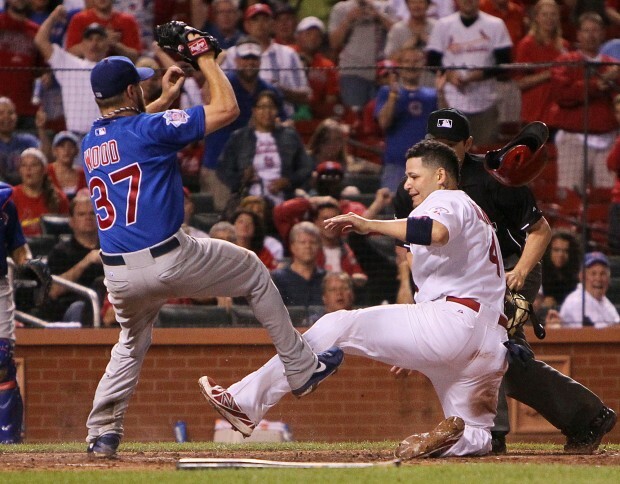 As did Yadi, only to meet Travis Wood at the plate — and he was safe to score the run, according to the ump anyway. Maybe he was, although Dale Sveum certainly didn’t think so and his arguments provided some fun lip-reading, which you also can see in that video clip (and hear Ricky Horton say “Dale Sveum is hot!”) Ultimately Sveum was ejected and Kozma was for some reason made to go back to first base. The Cards 4th and 5th scored in much less dramatic fashion, with both coming on sacrifice flies — one by a pinch-hitting Shane Robinson right after the dust had settled from the 3rd run and the other by Allen Craig in the 8th. Tonight is the second of the four-game series and it looks to be another good pitching match-up, with Jeff Samardzija and Adam Wainwright. Samardzija leads the NL in strikeouts with 104, while Wainwright is close behind at 97 and leads the NL with 10 wins. Game time is 7:15 p.m. This entry was posted in 2013 Season and tagged Chicago Cubs, Edward Mujica, Kevin Siegrist, Pete Kozma, Seth Maness, Shelby Miller, St. Louis Cardinals, Trevor Rosenthal, Yadier Molina by Christine Coleman. Bookmark the permalink.